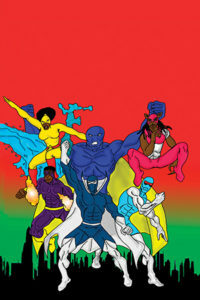 Boom Unit: The story of a group of heroes who fight against an evil corporation headed by Dr. Bukay whose aim is to corrupt and commandeer the world’s food and water supply. His henchmen are the diabolic Tricorn, the hypnotic Triclops, the not so smart Mr. No Brains, the deadly Gilaman and the villainess Razortooth. Trying to thwart these efforts are our heroes: Metro, the master of solar power; Cyberwolf, part cyborg, part Werewolf; Ratchet, the organic alien from the planet Nibiru; Mysteryman, son of Set and master of the chaos force; Spongeman, the human sponge/shape shifter and Aquatica, moisture manipulator and goddess extraordinaire. Together they are the Boom Unit! The evil Doctor Bukay has hatched a plot to take over the world’s resources- He seeks to control our food and water supply! Luckily for Earth, the Boom Unit stands ready to oppose his villainous plan. If there’s a problem, call the Boom unit and… BOOM! Problem solved!